METTEZ VOS orteils dans le sable avec nous! SI VOS DATES SONT RÉSERVÉES; VÉRIFIEZ AVEC NOUS UNE AUTRE DISPONIBILITÉ OU DES ANNULATIONS DE DERNIÈRE MINUTE POUR CETTE MAISON OU CONSULTEZ NOTRE MAISON DE 3 CHAMBRES À VRBO # 353899. NOUS N'AVONS ABSOLUMENT PAS DE FRAIS CACHÉS. TOUT SIMPLEMENT TARIFS QUOTIDIENS OU HEBDOMADAIRES AVEC UN FRAIS DE NETTOYAGE UNIQUE. VRBO / HomeAway a appliqué des frais de service à toutes les réservations en ligne. Les frais de service sont facturés au voyageur et ne sont pas payés au propriétaire pour la location du logement. Les frais de service sont visibles en tant qu'élément de ligne pour un voyageur dans le devis figurant sur la liste et lors du processus de paiement. SI VOUS ÊTES SATISFAIT DE VOTRE DEVIS, SIIMPLY DEMANDE DE LE RÉSERVER AVANT QUE QUELQU'UN SOIT. AUCUN BLUES D'ÉTÉ ICI À LA PLANTATION DE GOLF SHORES À FORT MORGAN / GULF SHORES !! CECI EST UN PREMIER TEMPS POUR PRIME FUN AU SOLEIL. RÉSERVER LA SAISON EST TOUJOURS SUR NOUS. RÉSERVEZ VOTRE SÉLECTION MAINTENANT. BATTEZ LA CHALEUR AVEC DES ÉCONOMIES IMPRENABLES AUTOMNE ET HIVER --- CONSULTEZ LES SPÉCIAUX EN COURS NON INSCRITS SUR LE SITE WEB. LES SNOWBIRDS SONT LES BIENVENUS. ENVOYER ENQUÊTE POUR LES MEILLEURES OFFRES SUR LES SÉJOURS À LONG TERME. Il y a des activités prévues pour les invités d'hiver. Notre condo rez de chaussée est situé dans le Gulf Shores Plantation Resort. Le condo dispose de 2 chambres et 2 salles de bains avec un salon et salle à manger spacieux assez pour une famille de 6 personnes. Les installations comprennent l'accès à la plage, 6 piscines extérieures, 1 piscine intérieure et 1 piscine pour enfants. Il y a aussi des spas intérieurs et extérieurs. Apportez votre équipement de sport et profitez d'un putting green, de courts de tennis, de terrains de basket-ball, d'un jeu de palets et de fers à cheval. Si vous envisagez de vous cacher au centre de villégiature, vous pourrez également profiter de la commodité d'un magasin général, d'un snack-bar et d'un bar à boissons. LES SNOWBIRDS SONT LES BIENVENUS. Renseignez-vous sur nos offres maintenant et réservez votre séjour tôt !!! Activités prévues pour les invités d'hiver. Des tarifs spéciaux sont disponibles. Faites des recherches supplémentaires par le biais de réservations. Beaucoup d'air salé gratuit. Salle de bain contiennent à la fois douche et baignoire. This was our second time to stay in this condo home. We LOVE it. Bottom floor, close to the on-site restaurant, has a washer dryer, and very very comfortable. I honestly can't think of a thing we needed that we didn't have. Owners are awesome and very accommodating. Never ready to go home from here. We stayed two months......and it wasn't long enough. Great memories and great food was done at your home. Thanks! This ground floor unit was just perfect, the owners are friendly and make sure you get all the info you need for a fantastic vacation. Ground level & close to the beach! Loved that we were on the bottom level with a short walking distance to the beach!! Pools very close! This was our first family vacation for our family of 3 and very pleased with our stay! House was clean! The beach chairs provided for use were awesome for the week. House decor was maybe a little outdated but otherwise no complaints (that’s not a complaint for me either)! Having a washer and dryer for use was awesome! Directly from outside sitting area is a tennis court but my 3 year old was caged in 😂. We had to call Sherrie for the correct location and she was very helpful and nice! Highly recommend! The condo was clean and ready for us upon arriving. The kitchen had everything we needed to cook meals for our family , even a crock pot! This was the first time we stayed on the ground floor and it was amazing ! Sherrie was very sweet and easy to get in touch with if we had any questions etc... The condo has a big outdoor patio area with lots of seating and a table too. This is what made it so easy, we walk off of the beach and right onto the patio and leave our chairs and sand toys there , no stairs , no elevator! There are two of the pools right outside the patio and a hot tub, lots of grills, they even have a grill at the pool inside the gate ! We loved it and will be back soon! We had a wonderful Christmas at the beach. 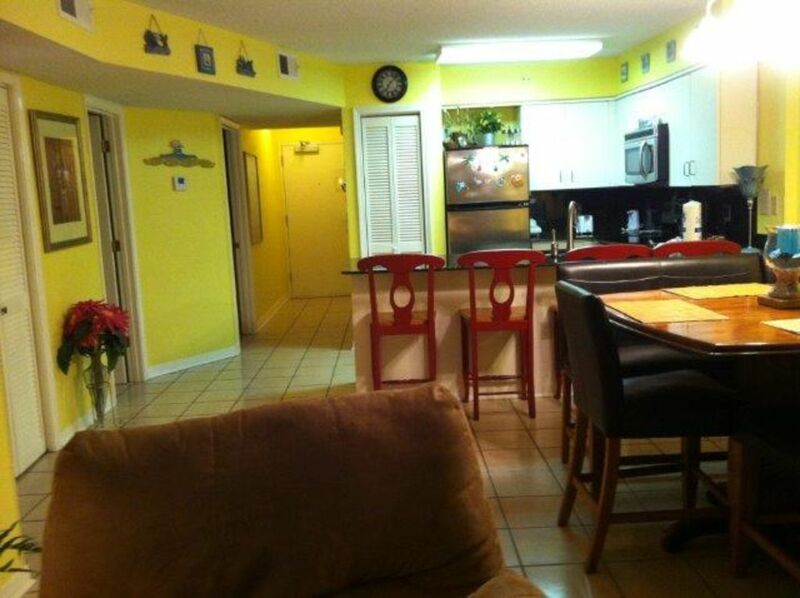 We could not have asked for a better condo with a great location and plenty to do around the complex. Sherrie was wonderful and was always available when I had a question. We loved it!! Cette propriété est située à côté de KIVA Dunes Golf Course. Il est un refuge faunique environ 7 minutes. Rates are subject to change. Email manager for current and up-to-date specials. Full balance of reservation fees are due when bookings are within 60 days of arrival. Otherwise, 25% or $300 minimum deposit is required with the balance due prior to 60 days of arrival. Rental agreement is required. Any questions regarding the rental agreement should be directed immediately to the owners and prior to acceptance. Check in is at 4pm / Check out 10am.